On Wednesday, Barack Obama returns to Berlin, home to one of the more dramatic moments from his first presidential campaign. In July 2008, speaking beneath the city’s 200-foot-tall Victory Column, Obama pledged to heal the transatlantic divisions that had erupted during then-President George W. Bush’s time in office. “The walls between old allies on either side of the Atlantic,” said the Democratic presidential hopeful, “cannot stand.” The 200,000 strong crowd received the candidate’s message of change with enthusiasm that day, and in the years since, Germans haven’t changed their minds about Obama. Today, according to new Pew Research Center data not yet released in a report, 88% of Germans say they have confidence in Obama to do the right thing in world affairs. In stark contrast, just 14% had confidence in Bush during his last year in office. 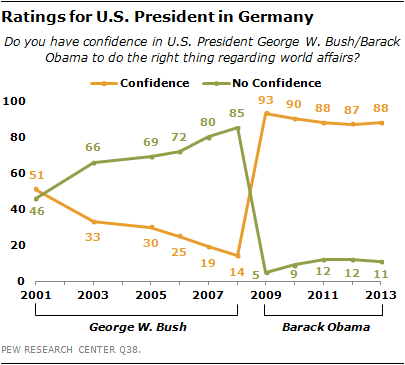 Across Europe, Obama has received more favorable reviews than Bush, but the gap between the two American leaders has been especially wide among Germans. And while Obama’s ratings have slipped a bit over time in countries such as Britain, Spain and Poland, they’ve remained relatively steady in Germany, with roughly nine-in-ten consistently expressing a positive view of Obama since he took office in 2009. In many nations, Obama is more popular than his foreign policy, but this is not the case in Germany, where 88% approve of Obama’s overall international policies. Obama has received high marks for his handling of global economic problems, removing combat forces from Iraq, and his administration’s anti-terrorism policies. Moreover, his popularity has clearly benefited America’s image. After he took office, the percentage of Germans with a favorable view of the U.S. more than doubled, jumping from 31% in 2008 to 64% a year later. Today, America’s ratings have ebbed a bit, although they are still on balance positive, with 53% expressing a favorable opinion of the U.S. in the new poll, while just 40% offer a negative view. Even though Obama remains popular, he has disappointed the German public on certain issues. A 2012 Pew Research poll revealed that Obama has not been as multilateralist as Germans had hoped, and they do not think he has done enough on climate change. And it’s worth noting that our survey was conducted before the recent revelations about the NSA’s surveillance programs, which according to some commentators, have generated strong opposition in Germany. But previous disappointments didn’t put much of a dent in the president’s overall image. Germany remains one country where some vestiges of the old “Obamamania” from 2008 endure – even more so, than in the U.S.